How to find files on the server? You may sometimes need to find files on the server that you have not yet linked into the structure of the website. It may also be useful to see what files are on the server for your website. Make sure you are in Browser mode. To go to Browser mode, click on Browser at the top of the Draft Console in the top left of the Contribute window. Click the Choose button to the right of Go and the Contribute address bar. 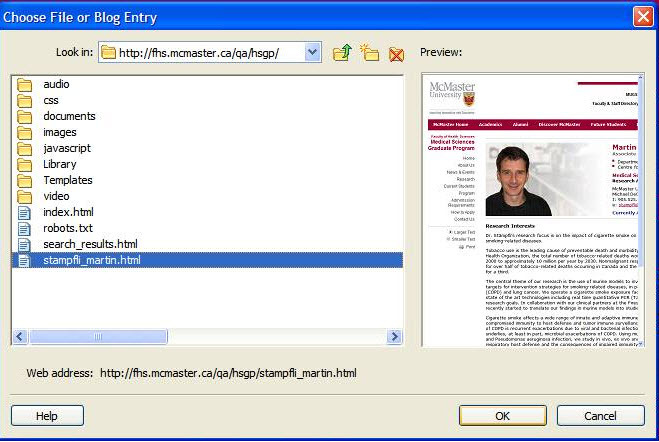 A Choose File or Blog Entry dialog box will appear. Browse to the file you want to view or change. Click OK. If the file you chose is a web page (.html file), then you may now edit the page. Other files (such as documents and images) may be viewed but not updated directly using Contribute.